Indian weddings are always so much of fun and giggles that you die to attend any of your far relative or friend of friend wedding, who cares? All that matters is, yummy food, playful rituals, those tumka’s at sangeet , brides lehenga and gossips about the tag and brand she wear and some really good wedding ideas that you can eye on. I have been seeing and going crazy that how could rick and autos would be a really cool way to include into your wedding day. It happened that I had to attend one of cousin’s wedding and I was amazed to see that bride taking her entry from the rick.. oh my my!! This is really so affordable. 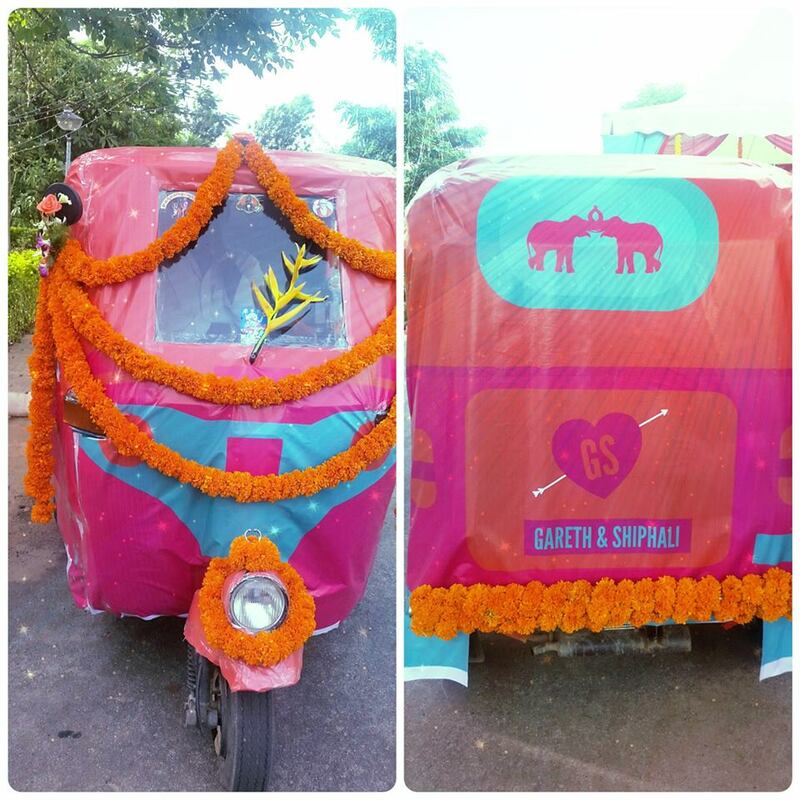 All you need is colorful plastic sheet stitched for auto with bride and groom’s name printed on it, then decor it with flowers as you like it. This one can be used by bride and groom entrance for sangeet! 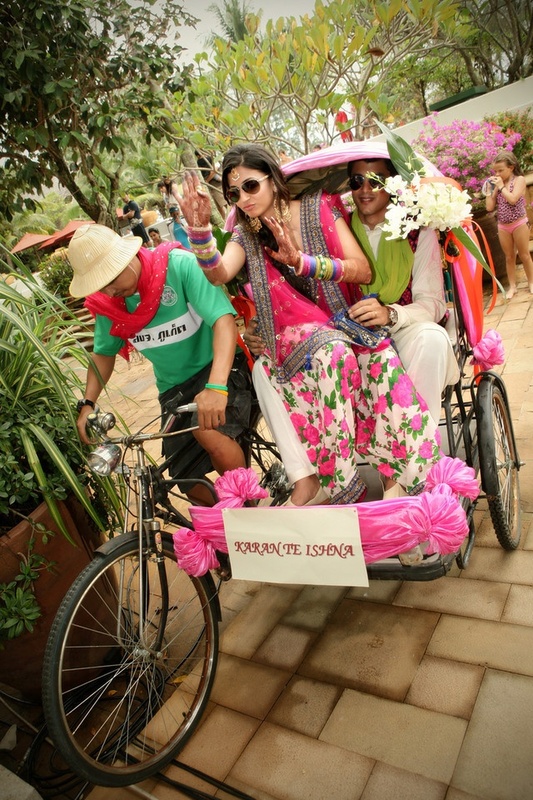 One more pretty entry of groom with bride on his lap with glares up in the rick. You can keep the rick as simple as this by just giving colorful ribbon ties and flowers at pom pom. I would have made it more witty by adding some outfit for the rick puller with some funky glares . 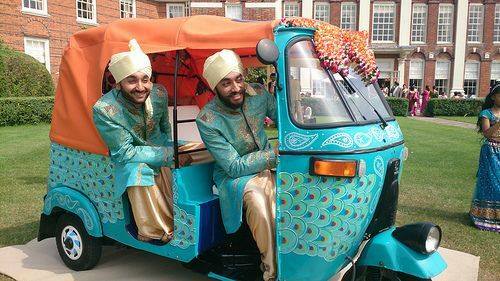 There are auto’s who making hits at the Indian weddings. 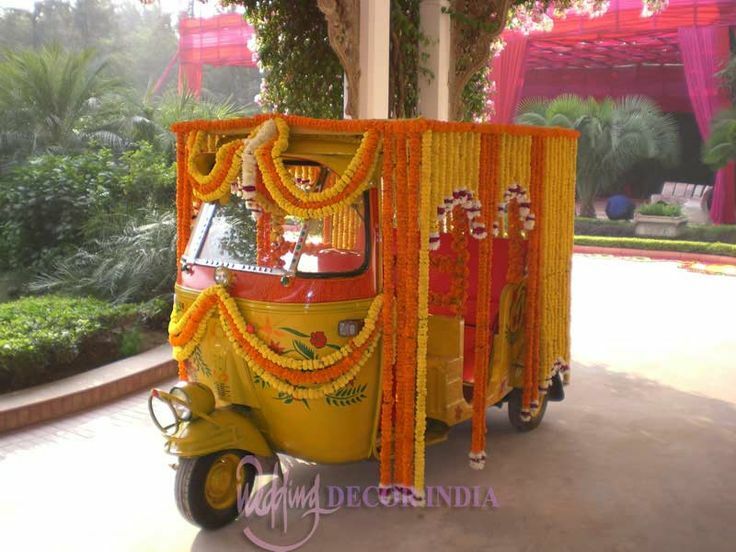 This auto with marigold flowers covered all over is so good when bride has to make an entry for her haldi. Its no lesser decorated than any car at weddings. Let your man take you for a ride at the very beautiful destination you wanna be together with. 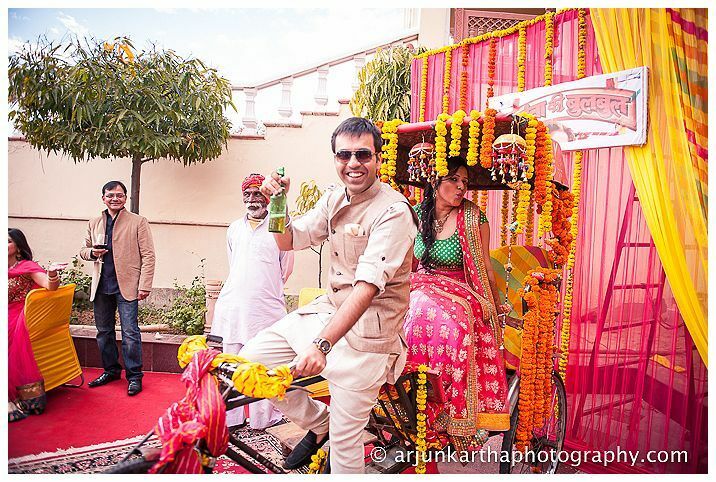 Groom with brew and bride sitting behind seems enjoying the ride. Did you also notice that hanging “— ki bulbul”? 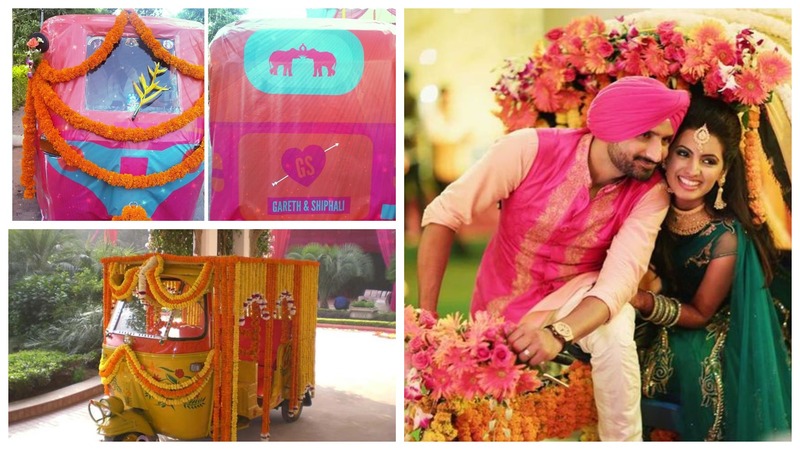 Did they ask their decor to get the auto colored to match with the groom’s outfit? It’s one more hit when your BFF is your auto driver to drop you till mantap. 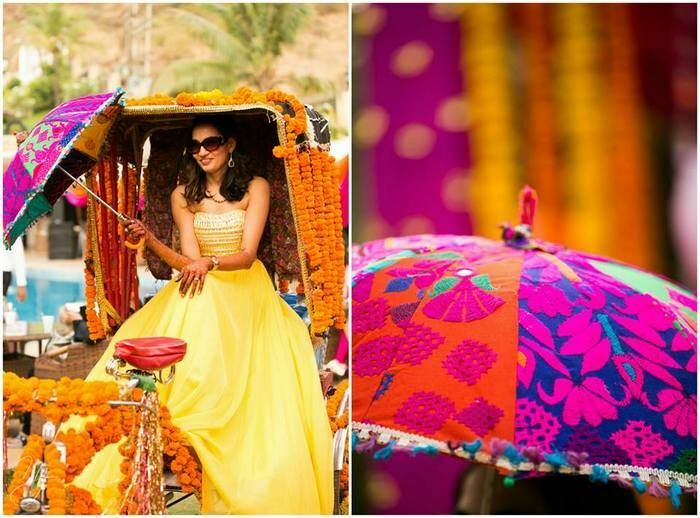 Its adding more to the decorated rick when the bride is arriving with some intricate colorful work on the umbrella she has got to cover from the sun. You should really have this pinned and saved for the future. 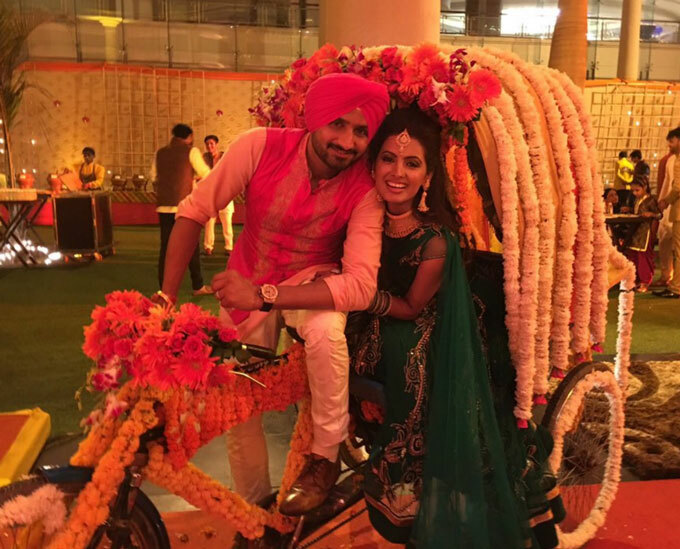 If you still doubt auto cannot be a good idea to drive-in for your mehndi ceremony then, have some inspiration from the latest wedding of well known cricketer Harbhajan Singh with Geeta Basra where the duo entered the function in rick. What are you up to? You liked it? 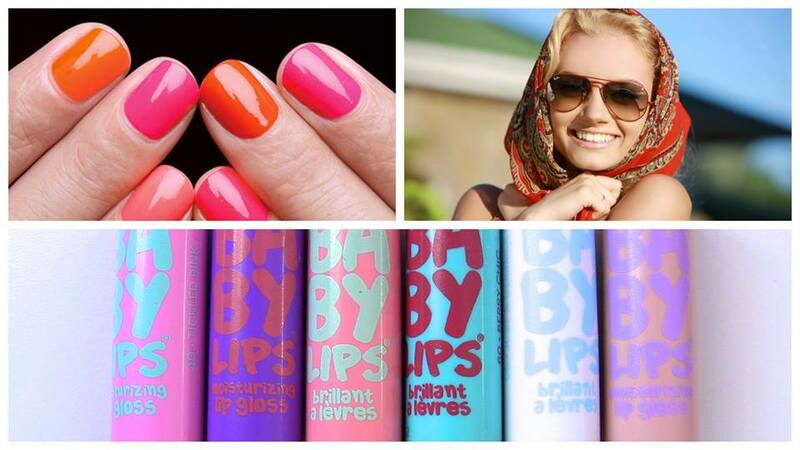 Let us know your love for this in the comment box below. Next : Dabboo Ratnani’s 2016 calendar shoot!